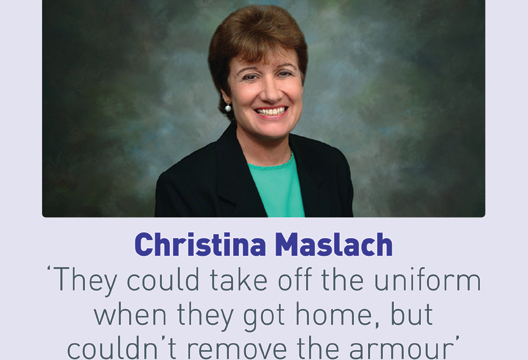 A response to our interview with Christina Maslach. I read with great interest your interview with Christina Maslach on burnout (September 2017). The points she made were immediately very familiar to me not so much in my role as a practitioner psychologist, but as an adoptive parent. Although their work is surrounded by a cultural stereotype of happiness, adoptive parents are at high risk of experiencing burnout – but, as elsewhere, they are invisible in discussions such as this. Adoptive parents take on some of the most needy and challenging children in our society. They not infrequently have to deal with violence (which can be directed at the parents, at siblings or others), self-harm, urinary and/or faecal incontinence, inappropriate and dangerous sexual behaviour, outbursts of anger, school refusal, persistent stealing, and more. Unlike people in other trauma-inducing roles, adoptive parents cannot take sick leave. They cannot resign or request a transfer to another department. Adopted children are yours. You cope as best you can. Given this, we should not be surprised that, according to a recent BBC report, the charity Adoption UK ‘thinks as many as a quarter of all adoptive families are in crisis and in need of professional help to keep the family unit together’ (www.bbc.co.uk/news/uk-38764302). I particularly agree with Christina Maslach is in what she says about the need for organisational change. Some of the biggest problems that adoptive parents face are with ‘the system’. Teachers, medical professionals, social workers and others all too often lack the training to properly understand adoptive families and their needs. Some local authority post-adoption services are competent and helpful. Some are well-meaning but incompetent. Some are abusive toward the very people they are paid to help. Adoptive parents save local authorities a massive amount of money – even when adoption allowances are considered. If local authority staff would simply acknowledge this fact, it would be a great step forward. For the time being my family has support from our friends, our extended family, our church and our neighbours. We survive – but sometimes only just.